Tahir is part of the ongoing series against Sri Lanka – and took three key wickets in the first ODI at the Wanderers in Johannesburg on Sunday. He announced his ODI retirement on Sunday after the Proteas’ eight-wicket win against Sri Lanka. ‘I have always wanted to play in the World Cup,’ said Tahir. ‘It would be a great achievement for me to play for this great team. I have a mutual understanding with Cricket South Africa and I decided that I would finish at the World Cup, that is why I am contracted until then. ‘After that, Cricket South Africa has allowed me to go and play around the world in various leagues, but I would also love to play T20 cricket for South Africa. I think I have the ability and can play a role in T20 cricket for South Africa. I am grateful for the opportunity. ‘I would love to play for as long as I can,’ he admitted. ‘But there is a stage in your life where you have to make big decisions, this is one of those big decisions, it is definitely the biggest decision of my life. 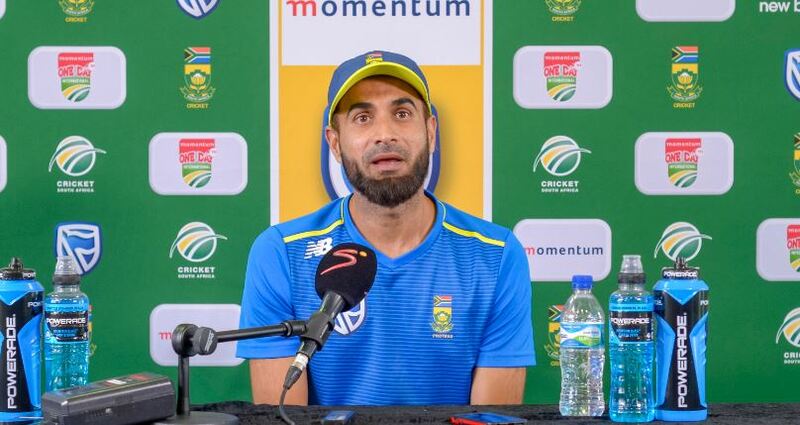 Tahir will turn 40 years old later this year – and was not among Cricket South Africa’s new contract list players earlier this month. The 39-year-old’s 156 wickets is the eighth-most for South Africa in the intermediate format of the international game. The seven who have taken more, are all seamers, while the retired Nicky Boje’s 95 is the second-most among spinners. Tahir is one of only a dozen cricketers to have taken seven or more wickets in an ODI. His seven for 45 against the West Indies at Warner Park in St Kitts three years ago bettered South Africa’s previous record – fast bowler Kagiso Rabada’s six for 16 against Bangladesh in Dhaka a year prior. Rabada, in seventh position, and Tahir, 11th, are the highest-placed Proteas in the International Cricket Council’s rankings for ODI bowlers. Tahir will remain available for T20I and Test selection, though he hasn’t featured in the latter since 2015. South Africa will meet England in the opening match of the World Cup at The Oval in London on 30 May. Currently, with 95, Tahir will likely earn a 100th ODI cap during the tournament.